Facebook and Apple's decision to offer female employees a $20,000 benefit to freeze their eggs indicates a stunning disregard for the complexities of reproductive biology. The Center for Genetics and Society issued a news release that listed societal, technological, and biological concerns: the danger of freezing eggs to both the woman and the individual that may one day arise from that egg, and adverse effects that include infertility, cancer, and even death. I'm recovering now from surgery to remove an 18-pound ovarian cyst, so I'm especially sensitive to tinkering with ovaries in any way. Marcy Darnovsky, PhD, executive director of the Center for Genetics and Society, summed up the bigger picture beautifully, which deals with intent, not biology: "Why are Facebook and Apple endorsing a technique that encourages their employees to put their health at risk? Paying for egg freezing is being presented as a benefit for women, but it may be that discouraging women from balancing work and family is really a benefit to the companies." I'd like to add another layer to the discussion: we just don't know that much about why older eggs tend to end up with a wrong number of chromosomes. A terrific recent research report in the American Journal of Human Genetics addresses exactly this issue: how do older eggs mis-sort their chromosomes? I wonder if the egg-freezing advocates at Facebook and Apple read it. I always felt weird, as a genetic counselor, telling a woman older than 35 that she was of "advanced maternal age." But back in the days of amnio, before non-invasive prenatal testing became available circa 2012, we did indeed consider these women high-risk. The "maternal age effect" is real: ovulating eggs with extra or missing chromosomes (aneuploidy) does happen more frequently as a woman ages. The risk of a woman carrying a trisomic fetus is 2 to 3% if she's in her 20s, but exceeds 30% if she's in her 40s. 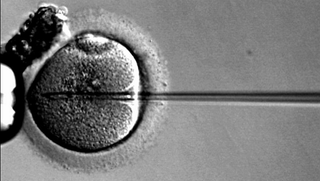 In my textbooks and classes, I'd flippantly call the phenomenon the "rotten egg theory," but it's technically termed the "production-line hypothesis," an idea first hatched in 1968 by Alan Henderson and Robert Edwards, who pioneered in vitro fertilization. The hypothesis states that the oocytes that have been hanging around in the ovary the longest accumulate the most errors. As my cyst, named Waldo, grew this past summer, I had plenty of opportunities to ponder the mysterious biology of the human ovary. The male of the species, not surprisingly, is simpler: he begins manufacturing sperm at puberty and continues to do so throughout life, without a monthly reminder of the process. A female starts making eggs when she herself is a 5-month fetus. That means a pregnant woman holds the future eggs that could become her granddaughters. Just before birth, a female has a million or so eggs stopped at a stage of meiosis (the form of cell division that makes gametes) when the two chromosomes of each pair tend to wrap around each other and exchange parts, a little like two people hugging and trading hats and belts. Apparently, this crossing over is very important for the ability of each chromosome pair to disperse into separate cells as division continues. An ovary housing developing eggs does indeed look like a production line, with baby eggs enlarging and developing as they reach the periphery. An ovary is a little like a bag of microwave popcorn. By puberty, about 400,000 eggies remain in a woman's two ovaries. Each month, a few eggs awaken and take a few more steps in meiosis, halting at the very brink of chromosome pair separation, like 23 pairs of aligned square dancers. At the mid-cycle hormone surge, the biggest egg pops out. Ovulation! The lucky female cell drops into the waving arms of a waiting Fallopian tube and moves towards the uterus. If a blast of sperm arrives and one dude penetrates the egg's membrane, the female cell, finally, finishes up meiosis. The egg then concentrates most of itself – cytoplasm, organelles, nutrients — into one daughter cell, along with exactly one copy of each chromosome type. The puny other cell, a polar body, exits the body, its function to siphon off the second chromosome set while concentrating supplies for the fertilized egg. Unless probed in a genetic test, as a previous post described, the polar body is flushed out. If the egg escapes a sperm's penetration, it too exits as the menstrual flow, meiosis unfinished. The female cycle may make us crampy and crabby, but biologically speaking, it is most elegant and not at all wasteful, only completing meiosis when it makes sense to do so. In the study reported in July, Terry Hassold, PhD, from Washington State University and colleagues took a closer look at events in the human fetal ovary. And they discovered that one assumption of the production line hypothesis, that the oldest eggs cross over less and that's why they may drop or add a chromosome, simply isn't true. The researchers used immunofluorescence microscopy to label proteins that mark crossovers, examining 8,518 cells from 191 samples from ovaries removed at 14 to 26 weeks of gestation. The material came from elective abortions. Results were surprising, considering how entrenched the production line idea was. The extent of crossing over varied, not greatly, between ovaries and even within ovaries. More importantly, the researchers found no correlation between age of either the egg or the woman and the extent of crossing over. "If the production-line hypothesis were true, you'd expect lots of abnormal cells and you would expect them all to be happening late. We do see a pretty high incidence of abnormal cells, but they're just as likely to be happening early as late," first author and doctoral candidate Ross Rowsey told WSU News. The effect might not have shown up in earlier studies that inferred crossing over from cells taken after birth because that approach didn't look at what was going on in fetal ovaries. The beauty of scientific inquiry is that when one hypothesis is disproven, investigators follow another. And in the case of the misjudged eggs, another possible explanation is that the reason for an extra or missing chromosome is ebbing levels with age of a protein called cohesin that, as the spellcheck-confounding name implies, glues chromosomes together, facilitating the exchanging of parts. Experiments from other species are now pursuing the cohesin hypothesis. The bigger picture is that Facebook and Apple are attempting to pay female employees to undergo a very risky procedure with not-well-understood consequences, when we don't even know the mechanism behind the maternal age effect. Hasn't the current Ebola crisis taught us not to ignore biology? This article originally appeared at PLOS Blogs' DNA Science Blog and is republished here under a Creative Commons Attribution 3.0 Unported License.